...and THE QUEST continues!!!! What quest is that, you ask? Well, if that's what you're asking...then shame on you! It's obviously the quest you haven't joined me in yet. The quest in which you didn't or even worse, did! hear my plea and jump on board with. So just in case you haven't heard...or just in case you ahem forgot...I'm on a quest. But it's not just any quest! 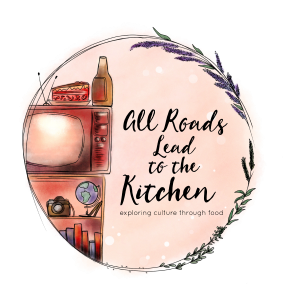 It is a quest to find THE most rockin' bowl of Tortilla Soup! I'm not counting out all of my friends who have joined me thanks you guys- mwah! so far...I just have visions of grandeur! Tortilla soup to the left...tortilla soup to the right...hot bowls of it in front of me...cold vats of it in the fridge behind me...glorious wet dreams of it that awake me with shivers of ecstasy! Have I mentioned to you that I ♥ tortilla soup? I'll admit, I've kinda let a bit too much time slip by since my last bowl...but I'm back with a vengeance, baby. Green is good. Right? So why have I been shunning green for red? I swear it wasn't intentional. All my previous tortilla soups have been red...or orange, I suppose...if I'm being literal. But in a moment of sheer genius...a new front-runner was born! It was quick. It was green. It was caliente. It was the thing my dreams are made of. I think I've mentioned before that we always have some form of salsa in the house...usually a blender salsa. Yes, in the height of tomato season, I make pico de gallo to celebrate the glorious tomato...but for the other 11¼ months, I go the lazy way and use my friend, the blender. This version of tortilla soup gets most of its flavor from a smokin' hot, ragin' good batch of salsa verde! Shake it if ya got it! I suppose you could use jarred/canned salsa verde...but I wouldn't advise it. Because I'm a total salsa snob like that. I've never actually tried it pre-made, because it's one of the easiest things on earth to make...so I haven't really had the need. Tomatillos, green chiles, garlic-roast or boil 'em. Put in blender, add liquid, some salt, cilantro-blend. I'm sure there's those people who don't have access to tomatillos, though...and I'll go ahead and give you a free pass here. The heat of the soup is gonna depend on the heat of your salsa. Make it wimpy if you don't like to sweat. Adjust the amount of salsa you add to suit your taste and heat-tolerance. I like to use homemade tortillas to make the chips here, because then I can make them extra thick...which means they still stay a bit toothsome after they've been covered with the hot soup. That's the way I like it. 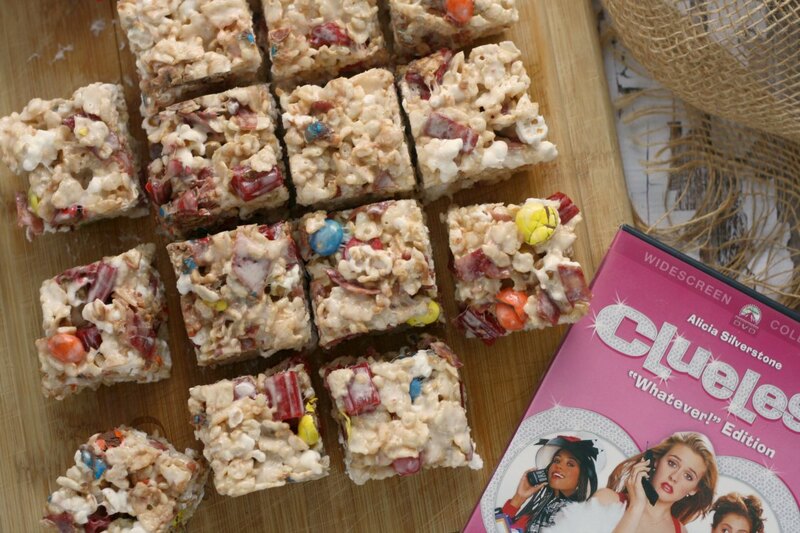 Of course you can use store bought. If you must. Stir together the salsa and the broth in a medium-sized pot. Heat gently to a boil. Reduce heat and let cook over a lazy bubble for ~5 minutes or so. In the meantime, cut up your tortillas into whatever shape you like...I liked squares today...and give 'em a quick fry in some hot oil...or bake them...you choose. Place your tortilla chips in your bowl. 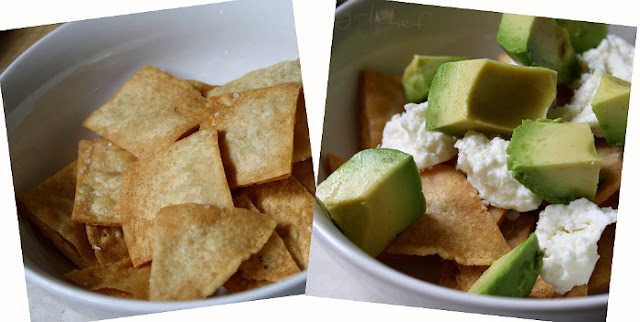 Dice some avocado and place it in the bowl with some big chunks of queso fresco. Taste your soup and adjust seasonings as necessary. I always season my salsa when I make it...and if you're not using homemade stock/broth, you never know how much salt is already in it...so TASTE IT FIRST then add salt and/or pepper if you think it needs it. 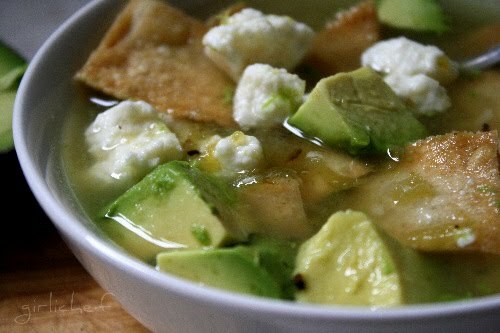 Ladle the hot soup over the tortillas, avocado, & queso fresco already waiting patiently in the bowl. Super simple. Super delicious. Just plain super. Super-dee-duper. Try some. And PLEASE...join me in my quest to find the ultimate Tortilla Soup!!! I need all the help I can get. And I like to drool. Simply click HERE for details...or on the button below. Don't leave me hangin'. I'm also sending this over to my friend Deb at Kahakai Kitchen for Souper Sundays this week...and I'm linking it up to Two for Tuesdays (cuz tortilla soup satisfies my soul in ways you'll never know)...and Slightly Indulgent Tuesdays and Tuesday Night Supper Club----exposure = more potential TORTILLA SOUP questers!!! You can get to any of those places by clicking on their buttons below. This green is certainly good! I believe that this one is spectacular. 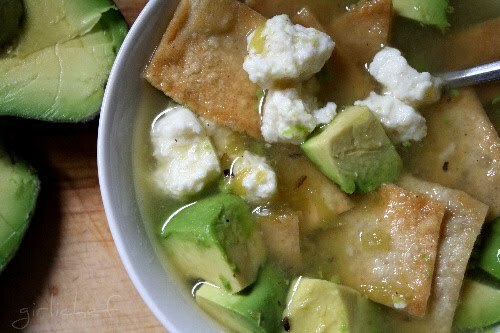 Que sopa más original con el aguacate, queso y las tortillitas. Delicioso. This looks good, love the green! This looks great! 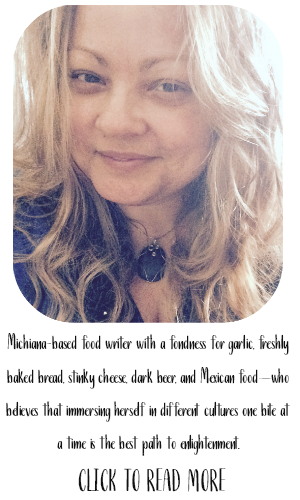 I LOVE tortilla soup and it can be made SO many different ways! 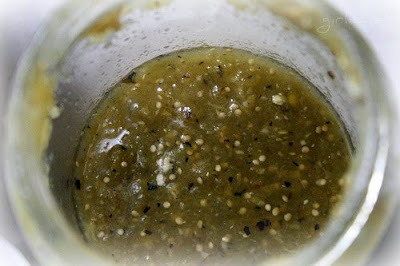 I just made a tomatillo salsa this weekend that I'm not sure what to do with, maybe I'll make this. Thanks! Hey Heather, great minds think alike! I'm making tortilla soup later today. :o) And also, I will be joining you for Two for Tuesdays but my post will be up a little late so probably not until this afternoon. So I'll be back! Healthy yummy soup ! !i always love tortilla corn soup...this one is different...shud try..
OMG! I so prefer green over red, and this is perfect!!!!! I love tortilla soup and this green soup sounds very delicious and original. I haven't been following you long enough to know about this challenge, but man, I really, really love tortilla soup. I make it every few weeks and it's always different. This one looks great! I am making this soup TODAY. OMG, it's actually cold in my house this morning, and I could soooo use a steaming bowl of this to warm my fingers! I'm such a sucker for anything with tomatillos, but such a nice contrast in soup, not enough soups have a nice acid balance. I have never had tortilla soup, but I think that is an oversight that I must correct soon! This looks superb. Hot soup over avocados is something I have never imagined doing but it sounds just perfect. Thanks for this. You know I am a late convert on avocado :O ...but I am ready for green soup anytime soon. 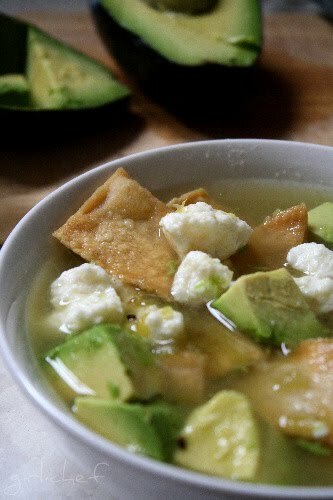 ahh..I love tortilla soup..this one looks delicious..love the avocado chunks in it..yum yum!! Beautiful! I love the avocado chunks floating along..! Yum! It looks delicious! Love tortilla soup! oh man, pass that bowl over here wouldja! this looks So good! If there's one thing I love, it's tomatillos and salsa verde. That tangy deliciousness. I would like a whole bowl of it. Great soup! Simple enough even I can make it! Awesome t4t post! This looks so yummy and healthy...I love anything with avocados...such a hearty soup! The avocado in the soup has to be delicious! 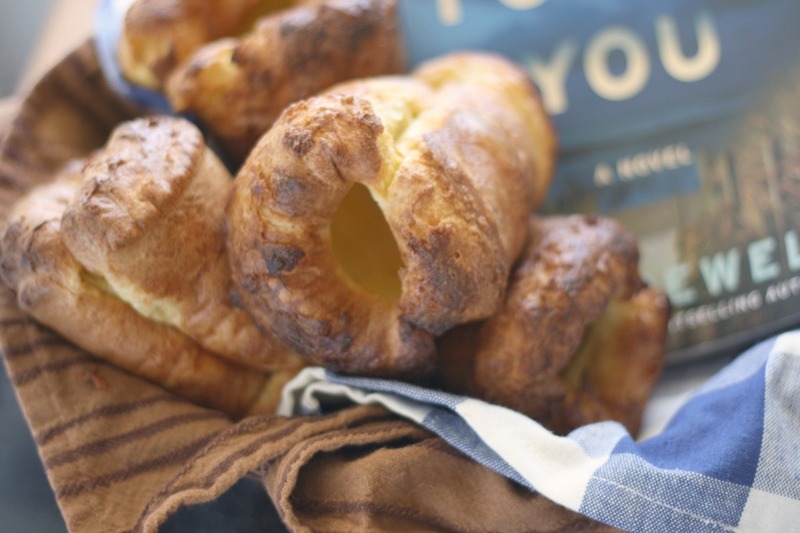 I love how easy this recipe is - sound great! I wish I had a bowl of that soup to warm me up on this chilly night. Looks delicious! Green tortilla soup; I love this! I will definitely have to try it out and join you in your quest for the perfect tortilla soup, although it looks like you have a pretty good leg up on this already. It's going to be hard to top your attempts! I very much would rather have green over red! Yum! Love the avocado in this- it looks great! Girl, what is wrong with you! You are just making me so hungry. That look divine!! gimme, gimme:)) I've got to print the recipe and make this soup. You definitely are my cup of tequila...er tea. :DD Beautiful photos, I love it girlie. Thanks. 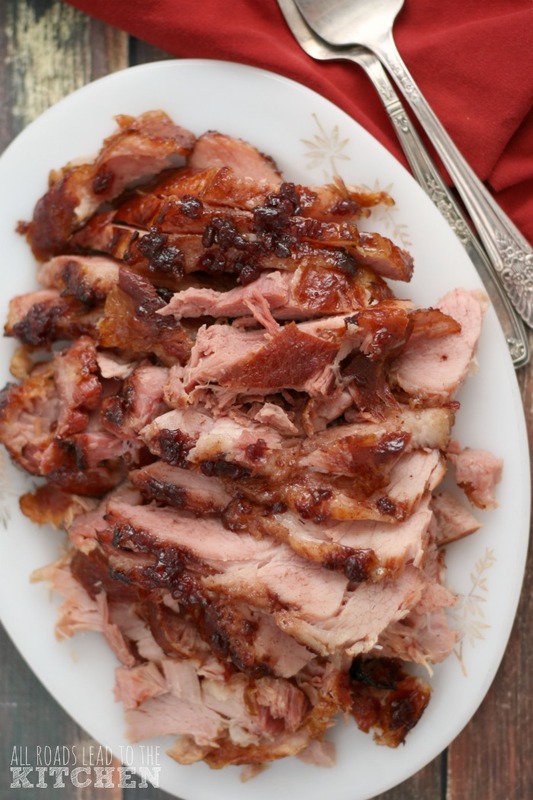 oh, mouth-watering. my mother--in-law brought over two bottles of home made salsa verde after visiting a farm that grew tomatillos. That's a recipe I'll need to try when I get the next shipment in! 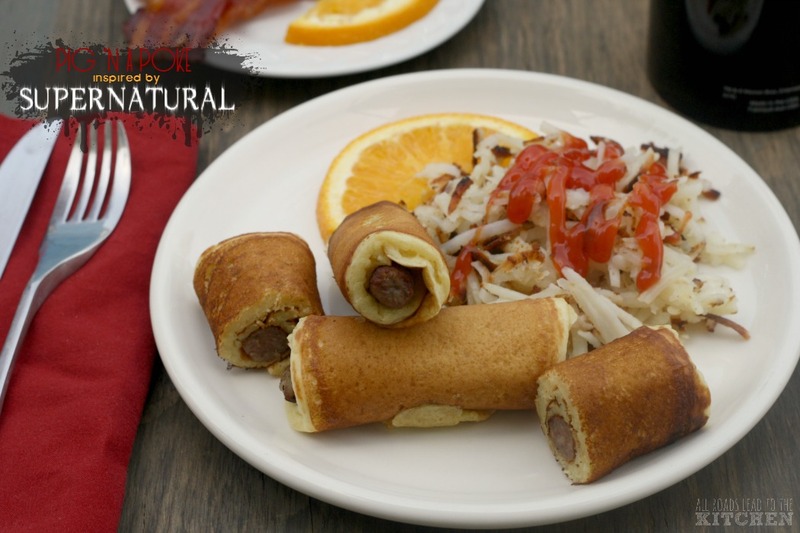 This looks and sounds absolutely delicious!!! Don't miss the Garlic Giveaway I have going on right now (you had mentioned you would like to grow some). Stop on by ... Thanks for the post! Ohhhhh this looks divine -- I have added this to my 'to make' list, mmmmmm and I have tomatillos coming in my veggie box delivery today! Perfect! Next time you are making salsa verde, try fire roasting your veggies first, it is unbelievably good! Chris...Yup, that is my favorite way of making salsa of any sort...I love the flavor it imparts...so earthy...it's perfect =)! That picture is killing me - I so want a big bowl right now! Heather, thanks for stopping by my blog, and sharing your concern. We are all incredibly lucky here to be safe. Love the look of that tortilla soup - that looks like something that would be immeasurably comforting right now. Oh how I know this is good. Sometimes I just take broth, avocado and tomatillo and make up my own, just for the flavor, gotta have that flavor!